Bedford, Blair, Cambria, Centre, Clinton, Fulton, Huntingdon, and Somerset. 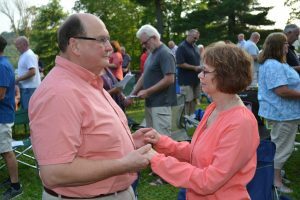 Outdoor Mass for Married Couples - Sunday, July 14, 2019 at 7:00 p.m.
Sunday, July 14, 2019 – 7:00 p.m. Annual outdoor mass for married couples will be held on Sunday, July 15 at Loretto for ALL parishioners of the Altoona-Johnstown Diocese. Bishop Mark will be celebrant and homilist for the mass honoring those living the Sacrament of Marriage. Each Fall, two separate celebrations will be held to pay tribute to couples celebrating milestone Wedding Anniversaries within that current year of 2018. 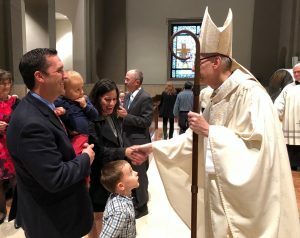 One mass will be held at the Cathedral in Altoona on Sunday, Sept. 15, 2019 and the other at St. John Gualbert Cathedral in Johnstown on Sunday, Sept. 22, 2019. Bishop Mark will be the celebrant and homilist at the Masses. All participants receive a certificate. A light reception follows each event. Reservations are only accepted through your parish beginning in August. 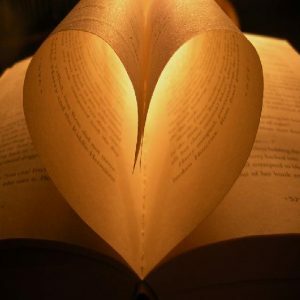 Rediscover the one you love! Get away from jobs, kids, chores, computers, phones and focus only on each other. If you would like greater depth, growth and enrichment in your relationship, don’t miss this chance. 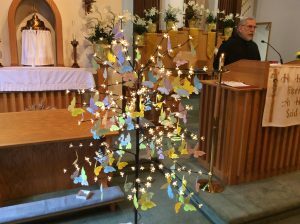 Pictures from the Day of Prayer for Widow and Widowers of the Altoona-Johnstown Diocese–Wednesday, April 11, 2018. The hectic and busy lives of people easily lead them into a situation of over-looking or forgetting those who cannot keep the same pace–those with intellectual disabilities–by accident or from birth. Faith & Light is a faith sharing group which includes family members, caregivers and friends of persons with intellectual disabilities. 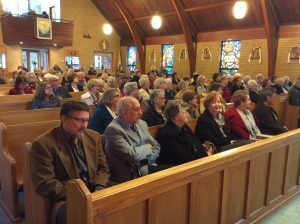 Meetings are held at the Family Life Office with activities held throughout the diocese. Stoning is not just an ancient act of violence. Each day in our homes we throw stones of ridicule, criticism, name-calling and put-downs. All of it is deadly. Hear Jesus in today’s gospel: “Whoever is without sin can throw the first stone.” Rid your home of violence. Stop verbal stoning! Today Jesus tells us “I am among you as one who serves.” In accepting the palm branch today you publicly confirm your baptismal promise to follow Jesus as “one who serves.” Selfless service defines a family as Christian. Jesus connects PEACE and FORGIVENESS in today’s gospel. In our families we will only experience peace to the extent we forgive one another. Peace is purchased with the currency of forgiveness. When we allow our anger and pride to lock out others, we also lock out peace and harmony. Evangelizing tool for families of all ages and stages promoting family communication and faith sharing. 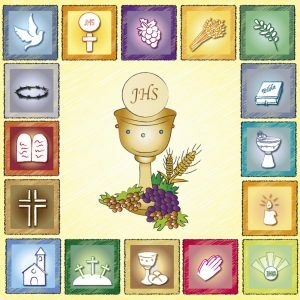 Contains a monthly reflection, Sunday readings with discussion questions, simple daily activities or thoughts, listed Holy Days, Holidays, and Feast Days. Published since 1982…our 37th year! Bulk orders available for the 2020 Catholic Family Calendar! The calendar can be ordered for churches by funeral homes, parishes, schools, or businesses as an advertising tool. Bulk orders over 100 with free ad space available at a substantially reduced rate. Orders due in our office by August 1, 2019! More information at a later date. Practical and spiritual ideas for grieving persons and families. Focuses on grieving as a normal process of healing. Section with questions for individual reflection or group discussion. 55 page booklet. Ideal guide for families and individuals in search of spiritual and festive home practices. Contains traditions, activities, home rituals, and holiday legends from Thanksgiving to Epiphany. 53 page booklet. Ideal guide for families and individuals in search of spiritual home practices focusing on the Lent and Easter seasons. Contains popular traditions, rituals, and devotional activities. 40 page booklet. Ideal guide for families and individuals in search of spiritual home practices focusing on activities from Pentecost to Thanksgiving. Two parts: Ordinary activities in the life of a family; Holidays and Holydays. 36 page booklet. 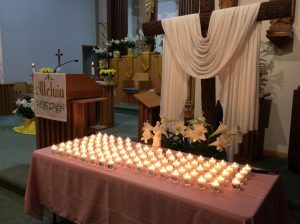 This ministry attempts to reach out to families who have experienced the loss of a child through miscarriage or early fetal death by providing them with spiritual tools to help them to grieve their child. Ideal Baptism gift or handout for parishes. Helps trace and record growth and development of child’s spiritual and physical life through writing and use of 80 stickers to mark baby’s “first” memories. ~ Parent resource for married and single parents, Catholic and Christian interfaith couples, parents already strong in their faith practice and those wondering where to begin. Sequel to Passing on the Faith: Baby’s First Year.